Credit: Leah SteigerSammy Hagar and his current band The Circle recently announced plans to release their debut studio album, Space Between, on May 10. Now, the group has revealed the record’s track list, as well as the dates for a U.S. spring tour. The trek kicks off April 19 in Reno, Nevada, and is plotted out through a June 7 concert in Tinley Park, Illinois. Former Motley Crue frontman Vince Neil and Night Ranger will open for Hagar & The Circle on select dates during the tour. Tickets will go on sale to the general public this Friday, February 8, at 10 a.m. local time, while pre-sale tickets will be available starting Wednesday, February 6, at 10 a.m. local time. Visit RedRocker.com for more details. Those purchasing tickets to the shows, with the exception of the June 4 concert in Lewiston, New York, will receive a CD copy of Space Between, as well as a digital version of the album. Space Between is available for pre-order now. It features 10 tracks, including the lead single “Trust Fund Baby,” which was released last week digitally and via streaming services. 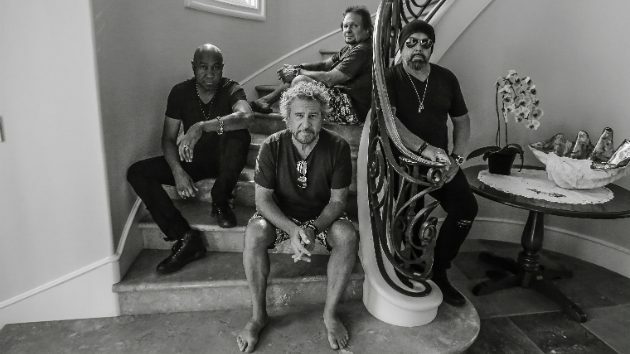 Hagar is joined in The Circle by founding Van Halen bassist Michael Anthony, drummer Jason Bonham and guitarist Vic Johnson, who also is a member of Sammy’s longtime backing group The Wabos.